Title: Betrayal of Spirit: Jew-hatred, the Holocaust, and Christianity Author: Thomas A. Idinopulos Philosophical and Cultural Studies in Religion Imprint: The Davies Group, Publishers soft cover 244 pp. 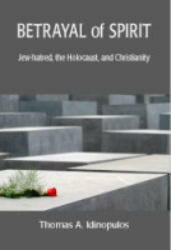 USD 24.00 ISBN 978-1888570960 January 2008 The author draws on a unique combination of personal experience and theological reflection to examine how anti-Semitism invaded, occupied, and dominated the human mind throughout history. His insightful theological interpretation of the history of Jew-hatred in Christendom provides a way of understanding how anti-Judaism differs from anti-Semitism, and reveals how anti-Semitism created the possibility of, but was not a direct cause of, the Holocaust. The author addresses such questions as: In what ways does the history of anti-Semitism explain the Holocaust? And, in what ways does it not explain the Holocaust? Other questions that rise out of the more technical concerns of historiography: How do we explain the unexplainable? What was the role of religion in Nazi thinking? What should we make of the Intentionalism/Functionalism debates among historians? The responses to these questions insightfully reveal the interplay between rational and irrational, religious and racial components that combined to make the Holocaust a dreadful reality. Contents Acknowledgments Foreword Preface Part One — Anti-Judaism and Anti-Semitism: Are There Differences Through History? Jew-hatred: Greco-Roman Times to the Spanish Exile; Jew-hatred: The French Revolution to the Nazis Part Two — The Problem of Anti-Semitism: Theoretical versus Practical Solutions; Christianity: A Guest in the House of Israel? Jews Be Damned: Is Christology Inherently Anti-Semitic? Eradicating Anti-Judaism from The Book of Common Prayer Part Three — Fateful Connections: Anti-Semitism and the Holocaust; The Nazi Vision of Utopia; Explaining the Unexplainable Part Four — Judaism, Christianity, and the Holocaust: Theological Responses to Evil; Jewish Responses to the Holocaust: There is No Law and There Is No Judge? The Churches and Hitler: Was There Church Resistance to Nazi Anti-Jewish Policy? The Question for Christians after the Holocaust: Was the Cross Triumphant Over Sin and Death? Betrayal of Spirit Selected Bibliography Index. Reviews "In penetrating essays based on his long and distinguished leadership in fostering good relationships between Christians and Jews, Thomas Idinopulos explores the Holocaust and its aftermath in ways that are at once personal and path-breaking, carefully researched and well reasoned, insightful and wise." —John K. Roth Edward J. Sexton Professor Emeritus of Philosophy Founding Director, The Center for the Study of the Holocaust, Genocide, and Human Rights Claremont McKenna College “In response to the existential question, ‘What is the relevance of my faith as a Christian to the Holocaust?’ Idinopulos constructs a theological and historical narrative that is also deeply personal. The shock, outrage and incomprehension that greeted his first youthful encounter with anti-Semitism in a loved and trusted friend led to his questioning the irrational power of hatred for Jews. Arguing for retaining the specificity of Christianity and Judaism despite what he sees as their reciprocal antagonism, he acknowledges their irresolvable differences. An answer is not to be found as some might wish in the creation of a wishy-washy universal faith but rather in the necessity for ‘visiting one another’s houses,’ and appreciating rather than attempting to erase the differences between them. He concedes that what has come to be known as the teaching of contempt is reprehensible and must be eliminated but, despite its importance, he finds in German nationalism and Hitlerian racism the principal precipitating factors in generating the holocaust. He is also fully cognizant of the millenarian aspirations and parallels between the social myths that portrayed the Jew as the betrayer of Christ in the First Crusade and as underminer of the German nation during the Nazi period. In the course of his account, he considers the works of Jewish thinkers such as Emil Fackenheim and Irving Greenberg, historians such as Jehuda Bauer and Daniel Goldhagen and Christian thinkers such as Clark Williamson. Idinopulos’ work does not come to a conclusion but rather points to the abstractness of evil and the ways in which the artistic faculties can be turned against themselves as the betrayal of spirit. Holocaust literature, he maintains, is the effort to invent a voice for what cannot be spoken and to restore a link to God, the aims of his own courageous project. —Edith Wyschogrod Author Thomas A. Idinopulos taught in the Religious Studies Department at Miami University in Oxford, Ohio. Among his 140 publications are more than eighty articles and book chapters on religion, politics, and literature in journals such as Encounter, the Journal of Religion, Journal of the AAR, Cross Currents, Middle East Review, and the Israeli Bulletin of Religious Affairs. He is the best-selling author of such works as Jerusalem Blessed, Jerusalem Cursed: Jews, Christians, Muslims in the Holy City from David’s Time to our Own, The Erosion of Faith: An Inquiry into the Origins of the Contemporary Crisis in Religious Thought, and Land Weathered By Miracles: Historic Palestine from Bonaparte and Muhammad Ali to Ben- Gurion and The Mufti.